Social media marketing is a the most challenging way to get dental patients online. 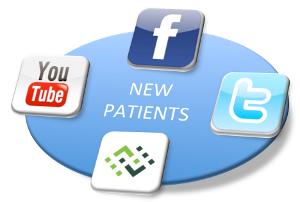 Many dentists who jump on the social media bandwagon, trying to find new patients learn this fact the hard way. They invest in a great page/profile, post a few updates, run some ads and then wonder why nobody is listening to what they have to sell. Well let me break it down for you – nobody logs on to twitter, facebook, youtube or any other social network site to buy stuff. Social media is like this big party where everybody is invited to have fun, gossip around, stalk others and maybe relax after a busy workday. I mean you could setup shop on a table in the corner of the ballroom but dont be surprised if everybody ignores you. Social media marketing is all about joining in the fun, making new friends, sharing stories, discussing problems and then maybe giving out a business card to people who need help. However, before you get the opportunity to give away your business card to interested individuals, you need to start a conversation. There are many ways of getting people talking to you but some are more effective than others. You just have to ensure that you offer something of value that will distract people enough to take you seriously. Below I discuss 5 ways how your dental office can draw people’s attention on the various social media networks. Whether it’s facebook, twitter or youtube, the first thing people notice when visiting any page or profile is the number of likes, followers, subscribers and comments activity you have. This is second nature to all social media users because we quickly want to assess the social value of the page or profile. You need to get a high number of likes, followers, subscribers and comment activity to grab people’s attention. The greater the followers count and activity level of your page, the easier it will be to attract more patients. This is why it can be incredibly difficult to get a new page or profile going. Why would anyone like a page that nobody has liked before or commented on? Therefore, you should invite all your friends, family, relatives and patients to like or follow your dental office page when it is first launched. You can even offer a small discount or free whitening in return. You can also advertise your page to generate likes. But the point is that you need social proof to get new dental patients from social media. Now that you have a decent number of likes and followers, you need to leverage that following to promote your dental office in their friends and social network. This is where you need to produce content that will grab the attention of your fans and followers and compel them to engage with your page and profile. Let’s be honest, nobody on social media will participate in anything that is boring so you have to make extra effort to make your content fun, original and interesting specially since dentistry is such a dry subject. But you can still post some jokes, memes, quizzes, surveys, studies, animations, videos, success stories and social experiments about dental related topics. When your fans and followers like the content you produce, they will share it with their friends and social circle and thus take your office name further. The content will want people to visit your page and for more cool stuff you have to share. Discount offers specially limited lime offers work very well in a social media setting. The main reason for it is limited time – people believe they stand to lose something if they don’t act and this leads then to claim the offer. For e.g. If somebody who has not visited the dentist for over 6 months, sees an offer for a $49 exam + xray, they would be happy to give it a shot. However, you do not want to overdo this stuff because then people will be turned off by the number of offers you are sending out every month. Your promotions to content ratio should be very low around 1 promotional post for every 20 educational/informational/fun posts. This is again connected to social proof because most people do not want to risk going to a new dental office. Reviews and testimonials help people convince people that your dental office is the real deal and that you have several satisfied patients who recommend your services. This conviction then helps patients make the decision to contact you for professional help or claim one of your discount offers. 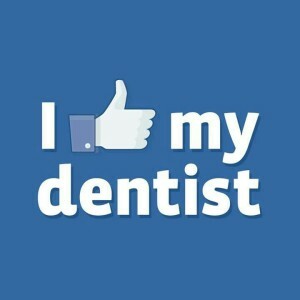 Without some positive reviews you will have a hard time convincing people on social media to visit your dental office. These photos act as proof that your services work and are powerful in grabbing attention of prospective patients. They help prospective patients see the transformation in black and white. Social media loves these kind of photos since a many the users suffer from the same or similar dental problems. and these before and after photos offer people something they can relate to. Seeing someone else overcome the same dental problem that you are suffering from is a very effective in attracting new patients.